Warning: there will be spoilers. 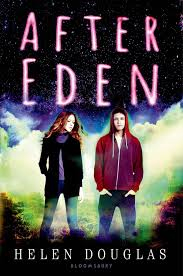 Before I get to that part, though, I will say that After Eden, by Helen Douglas (Bloomsbury, 2013), is a YA romance in which the central tension of the romance comes from time travel. If you are looking for a (pretty much insta-love) romance involving a beautiful guy, best friend issues, and a heroine who seems to exist only to fall in love with the beautiful guy; a romance that is light on physicality, but given considerable interest by time travel, this book is for you! Eden can't help but notice that Ryan is a little different, but it's not until she accidentally takes one of his books home by accident that she finds out the truth. The book reveals that Ryan is from the future, and he has come back to Eden's time to stop a chain of events that leads to the future destruction of life on Earth. Eden's best friend, Connor, is about to discover an exoplanet...and this will wreck havoc back on Earth. So Ryan and Eden find themselves not only allies in foiling Conner's discovery, but falling in love, knowing that they will never be together. Ryan will head back to the future just as soon as the foiling has been completed. The time travel part of the story was fine-- it was interesting to see Eden and Ryan busily working together to change things, and the suspense at the end, when Eden is in danger, was exciting. For starters, Eden was pretty much a non-character, with no life or interests outside of hanging with her friends and falling in love with Ryan (she's supposed to be a runner, but she only runs for the sake of running once). We learn that she is a decent, unambitious person who can't draw. She's basically not interesting. And yet Ryan is going to go to extreme lengths to make sure they have a happy ending...and I really have trouble with two teenagers just Knowing that they want to be with each other for the whole rest of their lives. Especially when one has made a major sacrifice to make it happen. For seconds, the bad guy from the future smokes (hard to believe that in an almost desiccated Earth they are still growing tobacco), and his mutation into Bad Guy is abrupt, exaggerated, and unconvincing. So no, it didn't work for me. But if you are in the mood for a kind of fluffy romance with a bit of a sci fi twist, it might be just the thing for you! I think I'll pass on this one - I haven't read a fully positive review from anyone.